Intel's rise and fall in tablets are starting to resemble the company's misadventures in netbooks less than a decade ago. The company is quickly distancing itself from basic tablets, a market it prized as little as two years ago, to go after detachable devices, hybrids, and high-end tablets that can double as PCs. Intel could also axe some Atom tablet chip lines that brought the company success two years ago. Intel this week laid off 12,000 people as part of a restructuring plan that could also include cuts in some product lines. Tablet chip shipments for Intel were down 44 percent in the first quarter of 2016 compared to the same quarter last year, the company said during its quarterly earnings call late Tuesday. That translates into roughly 4 million tablet chips shipped in the quarter, according to an estimate by analyst Dean McCarron of Mercury Research. It's a small number even in a declining tablet market. IDC is estimating worldwide tablet shipments will drop to 195 million this year, falling by 5.9 percent compared to 2015. Intel "had the same thing with netbooks," with the company targeting the market as it rose quickly before collapsing suddenly, said Jim McGregor, principal analyst at Tirias Research. Netbook shipments exploded in 2008, before starting to decline in 2010 after users started to move to tablets like Apple's iPad. 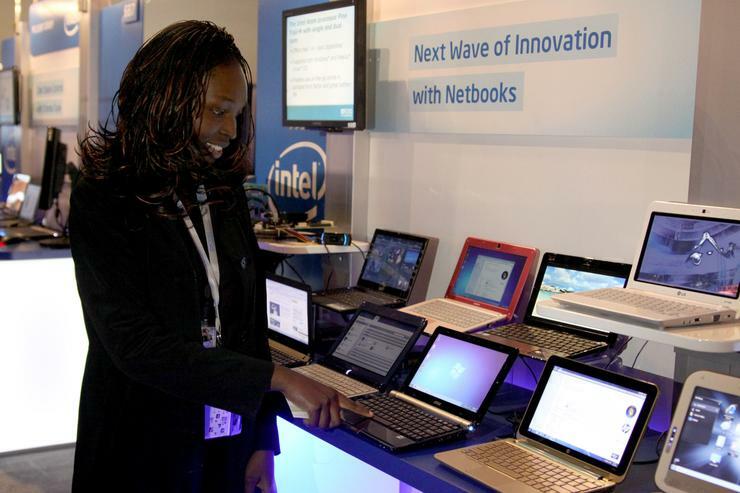 Netbooks were criticized for being slow and small, and Intel's chips for those PCs were slowly phased out by 2013. A market for netbook-like PCs has re-emerged in recent years with Google's Chromebooks. In the tablet market, ARM-based processors offer a better mix of performance and power efficiency, and investing in low-cost Atom chips for tablets isn't worth Intel's time if profits are a priority, McGregor said. The failure in tablets is among a handful of recent short-sighted moves by Intel's management. Intel has invested in a number of failed efforts over the years, including WiMax and a TV service called OnCue, ultimately acquired by Verizon. Intel is now focusing on the Internet of Things, data centers, and connectivity. Intel aggressively chased the tablet market in 2014, and the company said it would sell 40 million tablet chips that year. It subsidized its Atom chips for tablet makers, particularly small Chinese companies, which helped bring tablet prices down. The goal was to catch up with ARM, which dominated the then-hot tablet market. Intel met its goals, selling 46 million tablet chips that year. But it lost money on the chips sold and took billions of dollars in losses in its mobile division. Realizing the blunder, Intel in the following year focused on profitability instead of volume and market position. The results are showing. Intel sold fewer, but higher-priced, tablets, which contributed to a profit for the mobile division in the first quarter this year. Intel is now looking to cut products as it restructures operations, and some low-cost and low-volume Atom tablet chips could be casualties. The company may elect to not release a successor or refresh its current Cherry Trail line of Atom chips, which are used mostly in mainstream tablets and some low-cost PCs. The company hinted as much at IDF Shenzhen, where Intel emphasized its focus on tablet-PC hybrids. A new lineup of upcoming Pentium and Celeron chips called Apollo Lake will succeed the existing Atom X5 Cherry Trail line of chips, said Navin Shenoy, senior vice president and general manager of Intel’s Client Computing Group, during a keynote. Apollo Lake, which will be released in the second half this year, will primarily serve as a successor to the existing line of Pentium and Celeron chips, called Braswell, for low-cost PCs and hybrids. But by merging the Cherry Trail chips with Pentium and Celeron, Intel may remove the confusion people may have about its low-end tablet and PC chip lines. About 100 laptops and hybrids with detachable tablet screens are being designed using Apollo Lake, said Shenoy, who showed some prototypes on stage. Some of the products being designed may not ultimately ship. Intel's Skylake-based Core M chip is looking more like the company's tablet and two-in-one chip of the future. Atom tablet chips are getting squeezed out as PC and tablet makers prefer the faster Core M chips, which offer close to the same battery life as Cherry Trail. The Core M chips are used in higher-priced tablets, a market Intel is targeting. Cherry Trail is used in Microsoft's HoloLens headset, which delivers an estimated 3.3 hours of battery life. That's a sign that Intel could redirect its future Atom chips to headsets, wearables, and other IoT devices. Intel also makes Atom chips for smartphones, but won't give up on that market considering the company's heavy focus on cloud hardware, McCarron said. Intel's Atom chips are installed in just a few handsets, and the company is trying to catch up with ARM. But there is space for Intel to compete in the smartphone market, with more than a billion units shipped each year. Intel made a valiant effort to succeed in tablets, but now it's time for them to chase more profitable markets like IoT and data centers, McGregor said.